I wanted to try something new for a family barbecue, but we didn't have very much time to do anything very different. Back in May, I saw a recipe on CES for a red onion sauce popular on hotdogs in New York City, so I ran with that (with a few changes of course). The sauce isn't made of onions, it's a red sauce with onions in it. 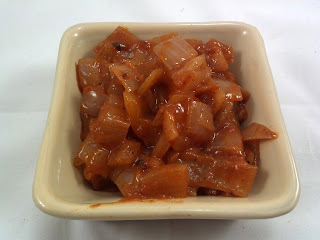 Or, more accurately, onions covered in a reddish sauce. The resulting sauce was very flavourful, and the cayenne added a good zing to it. In a medium saucepan, heat oil and on medium heat and saute onions until translucent. Add garam masala and chili powder and stir for one minute. Add remaining ingredients, stir, and let simmer, stirring frequently for 10-15 minutes, until mixture thickens. Note: this mixutre isn't a pickle like relish, so it must be refrigerated and eaten within 2-3 days. I make a similar sauce with BEER, but I love the garam masala in this. Sounds delicious! I made a fried okra salad with this spice last night and it was incredible! With beer? Ooohhhh. I love cooking with beer. Can you post or send me the link?